Almighty and everlasting God, increase in us Your gifts of faith, hope and love that we may receive the forgiveness You have promised and love what You have commanded; through Jesus Christ, Your Son, our Lord, who lives and reigns with You and the Holy Spirit, one God, now and forever. This day’s appointed New Testament reading is St. Luke 7: 36-50, “A Sinful Woman Forgiven”. 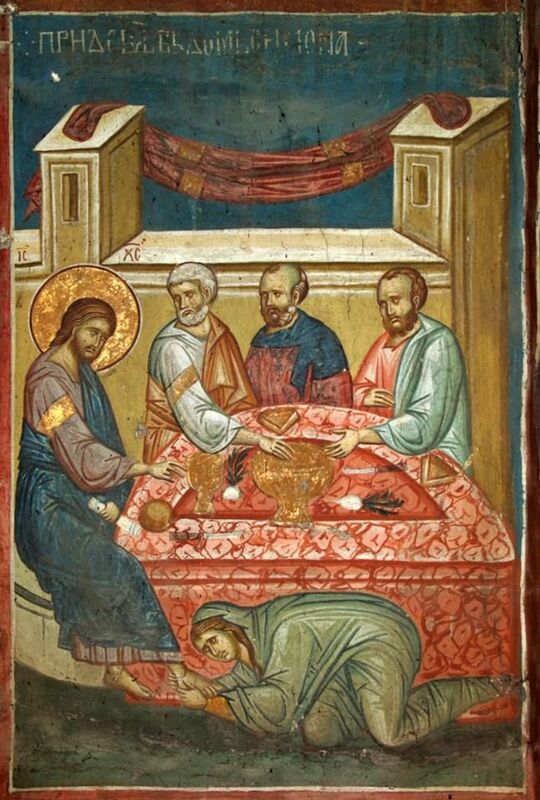 “A woman of the city, who was a sinner” comes and anoints Jesus’ feet with costly ointment and her tears, kissing them and drying them with her hair in the home of Simon the Pharisee. Simon is aghast at this scene in his home. These are two types of worship: the one is what I sacrifice to be good, the second is the One who is sacrificed so I am His and so good. AS there are two types of worship, so there are types of churches: the church of the sinful woman and the church of Simon, the Pharisee. In the first Church, the woman is not famous but infamous and her name not mentioned but she is known to the Lord. The Church of the Pharisee, in this world, everybody knows the ‘holy’ by name on the streets and in the media of our day. The first church is of faith, hope and love in the Savior, the only-begotten Son of God. The second church is of rules, regs and sparkling spiritual personalities. The first Church receives from the Lord, the second church always wants to get something out of God. The first Church knows she receives all blessings from the Lord, the second church positions itself to get what it wants to be externally ‘holy’. The true Church is the church of the sinful woman…and Paul and Peter and Lydia and Cornelius: all who know their Savior as He in His love has saved us and so we love because He first loved us. Then there is the spectacular churches of works. The first Church we are baptized into, the second church is of my choosing. These two churches will be until Christ comes again and then may we in Him be found.